Leningradsky Railway Station in Moscow. One of the favorite architects of Tsar Nicholas I, Konstantin Ton built the first railway station in Russia in Tsarskoye Selo and the two terminuses of the Nikolayevsky railroad from St. Petersburg to Moscow. We take a look back at how the first large railway stations in Russia were constructed. 1. The Nikolayevsky railway connecting Moscow and St. Petersburg was the first large-scale railroad in Russia. Construction of the line to link the country’s two biggest cities began in 1843. Architect Rudolf Żelaziewicz drafted designs for the intermediate stations and proposed the outline for a St. Petersburg station, though this was rejected. 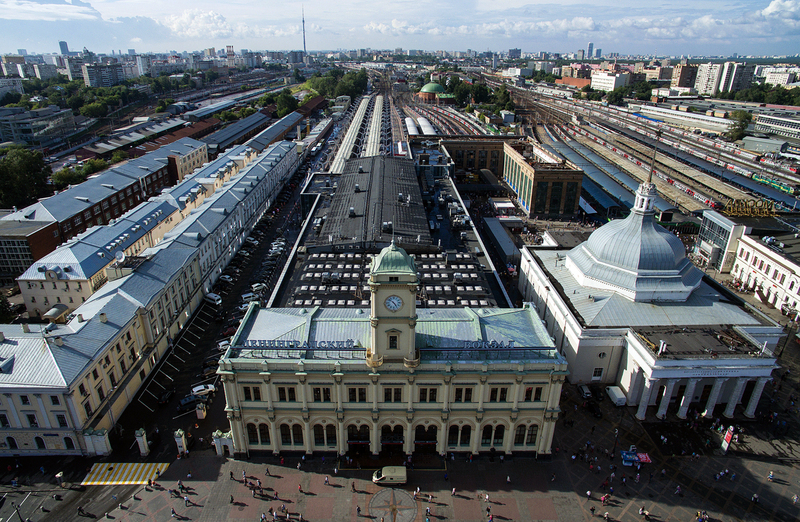 Tsar Nicholas I held a competition to design the station and eventually chose the project by Konstantin Ton. The winning architect had previous experience, having built the elegant and comfortable wooden railway station in the imperial suburb of Tsarskoye Selo, which was rebuilt in stone in 1849-1852. 2. The construction of the railway stations in Moscow and St. Petersburg started concurrently in 1844. The place where the Moskovsky Railway Station in St. Petersburg is situated today was the periphery of the city in those days. The initial design of the railway station included two symmetrical buildings: a customs office and a residential building. The latter was later abandoned. In Moscow the station was also built in a wasteland in the outskirts of the city. The New Field Artillery Yard, with a factory and storehouses for cannons and shells, was situated there from the late 17th century until 1812, when Moscow was set on fire during Napoleon’s occupation of the city. 3. Konstantin Ton did not supervise the whole process of the construction of the stations. The building of the Nikolayevsky railway was headed by Count Kleinmichel, the chief of communications and public buildings. He suspended Ton from his position of railway stations inspector after having an argument with him on construction issues. Ton’s post was then taken up by Rudolf Żelaziewicz. 4. The designs for the two railway stations were identical. These were two Neo-Renaissance-styled buildings with two-storied towers in the middle and large Palladian windows. The Moscow building was finished first, in 1849. The railway station was initially named Sankt-Peterburgsky Station and it was renamed the Nikolayevsky Station after the tsar’s death in 1855. In Soviet times the station was renamed the Leningradsky Railway Station. 5. The first railway stations in the two cities resembled each other both externally and in their interior decoration. The ground floors contained spacious halls, rooms for passengers and special imperial apartments, while the upstairs floors were set aside for railway workers’ official housing. The interiors of the stations were remarkably exquisite, with oak parquet floors and marble stoves. The first head of the Moskovsky Railway Station in St. Petersburg was Nicholas Miklouho, the father of the renowned traveler and ethnographer Nicholas Miklouho-Maclay. 6. The first train departed from St. Petersburg for Moscow on August 19, 1851, carrying Nicholas I, his family and two battalions of guards. The emperor was afraid of crossing rail bridges and crossed them on foot. The trip took 19 hours. The railway connecting two capitals was the first double track railroad in Russia. At that time, it was the longest in the world, totaling 400 miles (645 kilometers). The railway was built to the design of engineers Pavel Melnikov and Nikolay Kraft. 7. Three months after the first journey, rail traffic between the two cities became regular. Since tickets were expensive, passengers who could not afford compartment tickets traveled in freight cars or on open flatbeds. Buying a ticket was a multistep process. It was necessary to file a special request and to present a passport, information from which was copied into a special book. A remark was then made in the document stating “no obstacles to departure,” and only after that it was possible to buy a ticket. Awaiting a special call, potential passengers sat in waiting rooms, women separately from men.